Hi all, it’s the day of the demo. 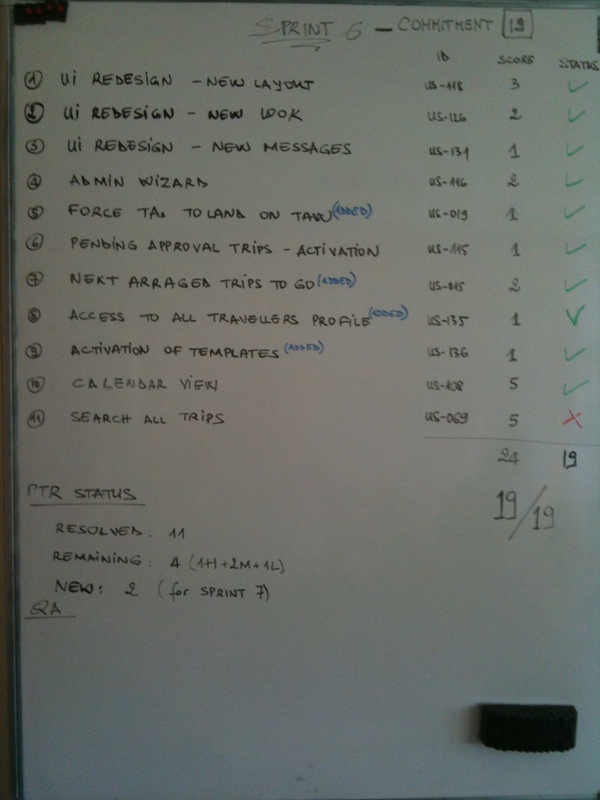 Here the sprint 6 commitment status. Today we did the first demo (sprint review meeting) of the functionalities developed so far. Unfortunately this morning when we arrived there was a bug on the demo server (we updated the last code just before leaving the evening before) , we fixed it before the meeting but we choose to do not show at all the user story “search the arranged trips” even if in any case it was not done. During the demo we found a problem on the story “search travellers” so our Product Owner decided to do not validate the story. There was just a little bug that we fixed in one minute in the afternoon but the impact was declared not acceptable to consider the story as done.